If a foreign tourist comes to Korea, he or she is most likely to visit the capital Seoul first, before venturing out to explore the provinces. 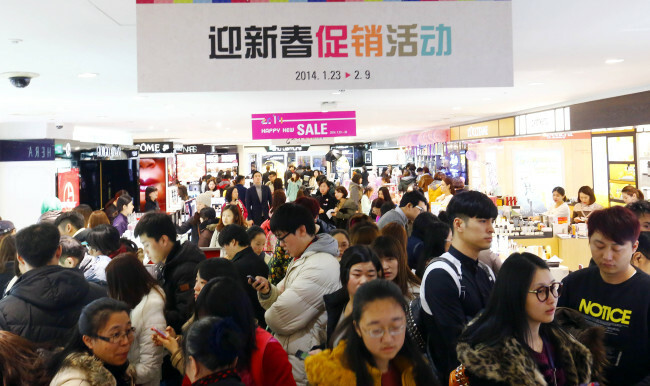 More than 12 million foreigners visited Korea in 2013, up 9.3 percent from 2012. Of these, some 10 million foreigners took a trip to the capital city. As for Chinese tourists, more than 90 percent visited Seoul, according to data compiled by the city-run Seoul Institute. Despite the status of Seoul as the face of Korea to foreign visitors, tourism programs offered have long been criticized for poor management and failure to reflect the diverse charms of Seoul ― a city which, behind its ultramodern look, boasts nearly 2,000 years of history. Most Seoul tour products currently offered feature similar itineraries that consist of a tour of royal palaces, group shopping tours and a visit or two to Korean barbecue places. According to a survey conducted by the Seoul Metropolitan Government, the three most-visited places by Asians visiting the city in package tour programs were the presidential office and residence Cheong Wa Dae, Gyeongbokgung Palace and Cheonggyecheon Stream. The survey was conducted by the Seoul Metropolitan Government from August to September 2013 on the 1,513 package tour products sold in six Asian countries including China, Japan, Taiwan, Thailand, Hong Kong and the Philippines. To improve the quality of package tour products and make sure that foreign tourists leave the city satisfied, the municipal government introduced a certification system in 2013. The system rates the overall quality of group tour products on offer and gives certification to those that meet a certain standard, which includes at least two nights’ stay at high-quality hotels; quality meals at least twice a day; visits to tourist attractions or exhibitions; and licensed tour guides. To qualify as a Seoul City-certified tour product, it must include two nights’ stay in Seoul, too. The city government approved 15 tour programs as of 2013. One of them is a three-day group tour run by Thai travel agency KTCC. Recognized by the Seoul government as an “Outstanding Tour Product,” the tour includes a visit to Jeongdongjin, a popular location for watching the sunrise, then traveling along the east coast by train and visiting a sheep farm, strawberry farm and then Gyeonggi Province amusement park Everland. Its Seoul itinerary includes a visit to Seoul Tower on Mount Namsan and an evening cruise along the Hangang River to enjoy the city’s night view. Other certified programs offer a variety of experiences one can have in Seoul. Some include visits to a Korean traditional medicinal spa and culinary adventure to try out diverse Korean food such as ginseng-stuffed chicken soup (samgyetang) or Korean food served in a modern way. Including new experiences raises the cost of tour programs by 160,000 won ($148) on average. A four-day Seoul city tour package, certified by the city government for Chinese tourists, was 940,000 won, higher than the average four-day city tour package price of 780,000 won. 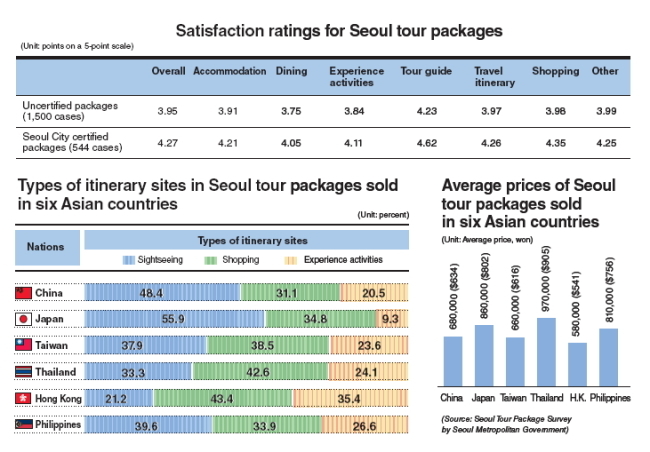 The survey showed that the average costs for typical Seoul group tour programs sold in six Asian countries range from 400,000 won to 700,000 won, and feature mostly sightseeing in popular tourist spots and shopping. The Seoul city tour packages sold in Thailand turned out to be the most expensive with 970,000 won while tour programs in Hong Kong were the cheapest at 580,000 won. City officials expect that the certification system will help improve the overall quality of Seoul tourism and bring in more tourists and plan to encourage more tour agencies to come up with more creative ideas. “Seoul will step up efforts to discover more interesting travel experiences and help tour agencies reflect such programs in their tour programs. We plan to offer administrative, financial support to certified tour programs as well in order to facilitate the tour product certification system,” said Seo Jeong-hyup, director of the travel division of the Seoul Metropolitan Government. According to the tourist satisfaction survey, the city-certified tour programs earned an average of 0.32 points more than regular tour programs in categories like accommodation, dining, activities, tour guide, itinerary and shopping. The city government accepts registration from foreign travel agencies throughout the year and conducts screenings every other month. Registration can be made by calling the Seoul Tourism Organization at (02) 3788-0842.